Is The World Abandoning The U.S. Economy? Go to any university, any center of equities trade, any meeting place for financial academia, any fiscal think tank, and they will tell you without the slightest hint of doubt in their eyes that the U.S. economy is essential to the survival of the world. To even broach the possibility that the U.S. could be dropped or replaced as the central pillar of trade on the planet is greeted with sneers and even anger. But let’s set aside what we think (or what we assume) we know about the American financial juggernaut and consider the sordid history of the money powerhouse myth. Germany, especially in the decade leading up to WWI, was an industrial giant, rivaling Britain in the production of raw commodities like steel, as well as the banking envy of the world. I’m sure very few economists of the era would have given any credence to the idea that the German foundation would in the near future collapse into hyperinflationary ruin. However, that is exactly what it did. In the span of 10 to 15 years, Germany was completely supplanted as the shining beacon of economic prosperity, never to return to a similar glory. The British Empire from WWII up until the late 1950s was the primary force in the global trade of oil, and the pound-sterling was dominant in the export and import of raw petroleum between nations. Extreme debt obligations and draining interventions in the Middle East set Britain on the path to currency devaluation, and the loss of its coveted reserve status. The point is, there is no such thing as an invincible economy, especially if it is predicated on overt debt creation, fiat printing, and reckless foreign policy. When it comes down to the raw data, the American system is just as fragile as any corrupt third world shanty-town nation. How have the MSM talking heads missed this trend? Simply put: Bias, controlled and pre-written talking points from their editors, as well as many half-baked presumptions. The popular belief amongst financial academia is that the IMF is a product of American economic might, and that the organization will do whatever is in the best interests of the U.S. at all times. The reality is that the IMF is fast becoming the central authority of economic operations around the globe, and America just happens to be paying the largest “tithe” to the respective coffers of the banking syndicate. Do you get more control in the operations of the IRS when you pay more taxes? The IMF’s goal is world centralization of economic control. For them, any sovereign nation is expendable in pursuit of the end game, including the United States. The IMF would not be pushing the issuance of a new world reserve currency to unseat the dollar if they did not intend to follow through, and they certainly would not hobble the greenback if they cared in the slightest about American economic concerns. A Treasury report on China’s status as a “currency manipulator,” already due but now delayed until after the elections, may become the catalyst for the final phase of the global shunning of American markets. With China being presented as a primary issue during the presidential debates, it would seem that regardless of who “wins” the election there will be strain applied to Chinese trade relations. 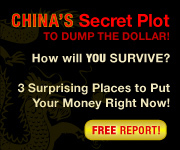 China’s incredible gold buying extravaganzas over the past few years (including an estimated 500 tons in 2011 and another 500 tons so far in 2012) indicate that they are indeed hedging against what they obviously expect will be devaluation in the dollar or multiple currencies around the world including the dollar. India continues its long tradition of gold buying, while Russia is now increasing its reserves by half-a-billion dollars a month. These are the actions of countries getting ready for a break in the financial system, not a recovery, and certainly not a return to the old days of American consumer bliss. The argument over whether or not the BRICS and the rest of the world can drop the U.S. economy and move onward has, ultimately, been rendered obsolete. Many will claim that a decoupling is impossible, but the fact remains that a decoupling is taking place. The consequences of this fiscal divorce remain to be seen, and the mainstream could very easily predict disaster for the BRICS. The real question they should be asking themselves, though, is which countries are better placed to survive such an event? Is the U.S. economy really built to withstand a loss of the dollar as the world reserve currency? Is the U.S. prepared for plummeting foreign investment and a reduction in its already dismal production capacity (production taking place by Americans on American soil, that is)? Is the U.S. really ready for extreme inflation in imported goods (most of the goods we consume)? Who really needs who more? It is time for the pundits and average Americans alike to set aside their commercialized and subsidized fake patriotism and question how strong our economy truly is. To ignore vast weakness today, is to feel vast pain tomorrow…. Be the first to comment on "Is The World Abandoning The U.S. Economy?"